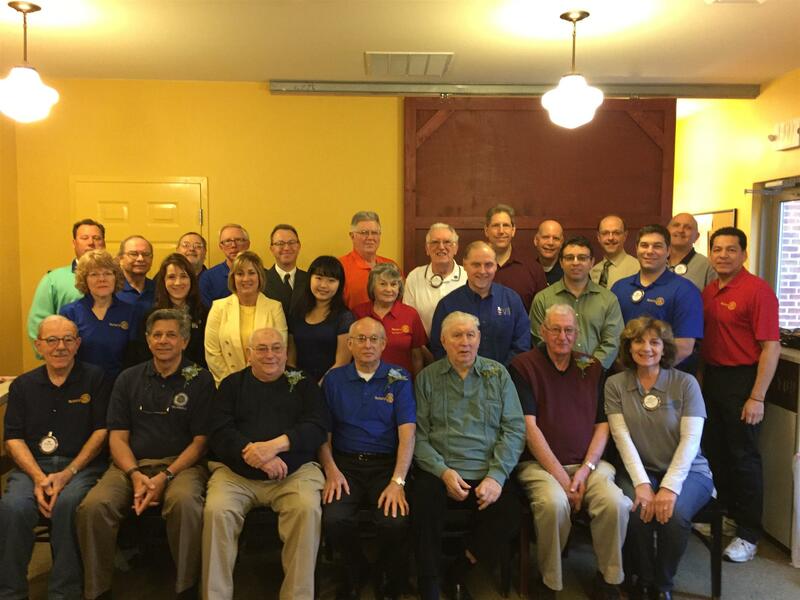 Please join us Friday mornings at 7 to find out more about Rotary! Hi, my name is Brian Jodon, the current president of the Zelienople Rotary Club. I welcome you to our website and invite you to learn about who we are and what we do. I invite you to share breakfast on us at the Spring Street Café on Main in Zelienople, Fridays at 7:00 am. The Zelienople 4th of July Parade is one of the best parades in Western PA and attracts people from all around the surrounding communities and even our neighbors in Ohio, and is sponsored by the Zelienople Rotary Club. If you enjoy some of the classics that any small town parade would include (Tractors, Classic Cars, Floats and Antique Cars to name a few), and even some big-time entries like the Shriners Parade Little Cars, look no further than our Independence Day Parade! 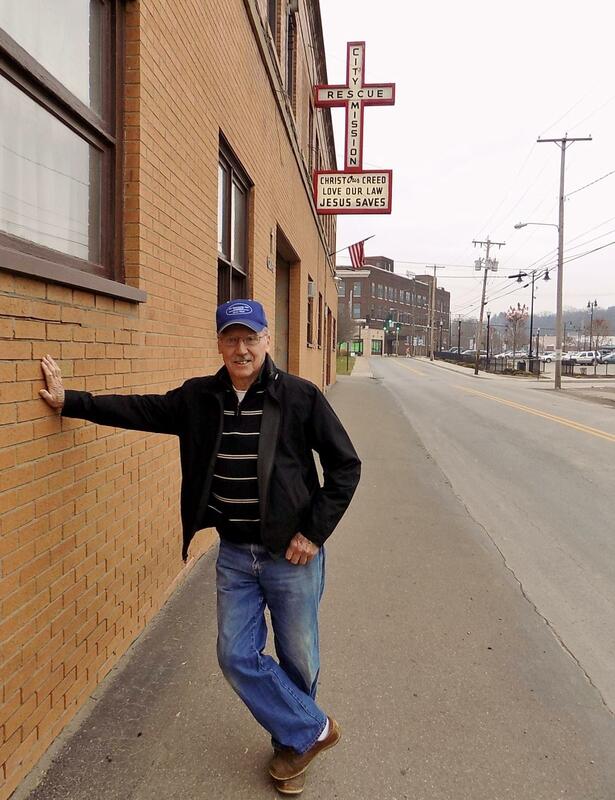 Over the years you will find that generations of families pick their spots along the parade route and start “reserving’ those spots the day before by placing their chairs and blankets so they get the best view of one of our towns greatest traditions. We invite you to join Rotarians and the community on Wednesday, July 4, 2018, starting at 11:00 am, as we celebrate this great nation’s Independence Day amidst the fan fair only found during this parade! *If you would like to be in the parade, please go to our Events Tab or Click here Zelienople 4th of July Parade to register. Attention Runners. Time to sign-up for our 10TH Anniversary Shamrock Shuffle. Enter to race the 1/2 marathon, 5k, and 1 miles races. We have great awards, finisher medals for all the races. Cool shirts and more. 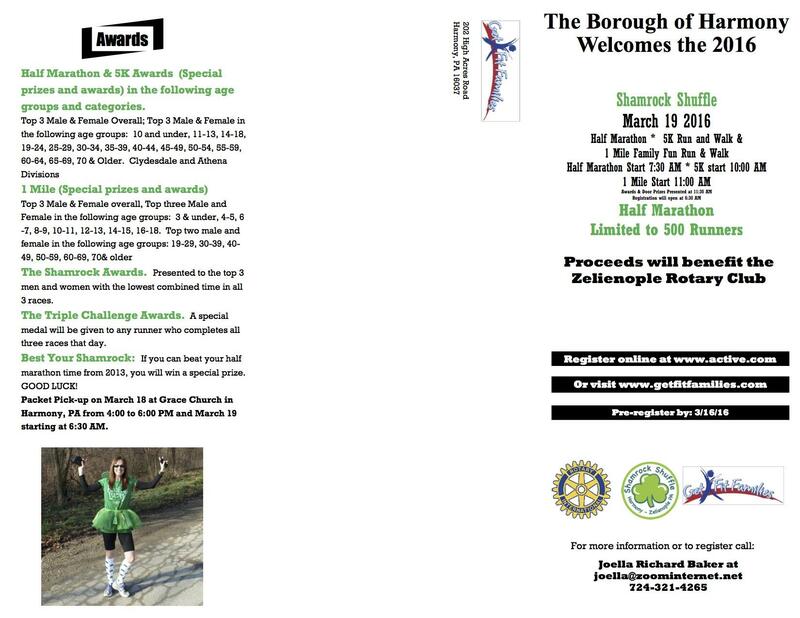 Join us this Saint Patrick's Day, March 17, Harmony, PA. 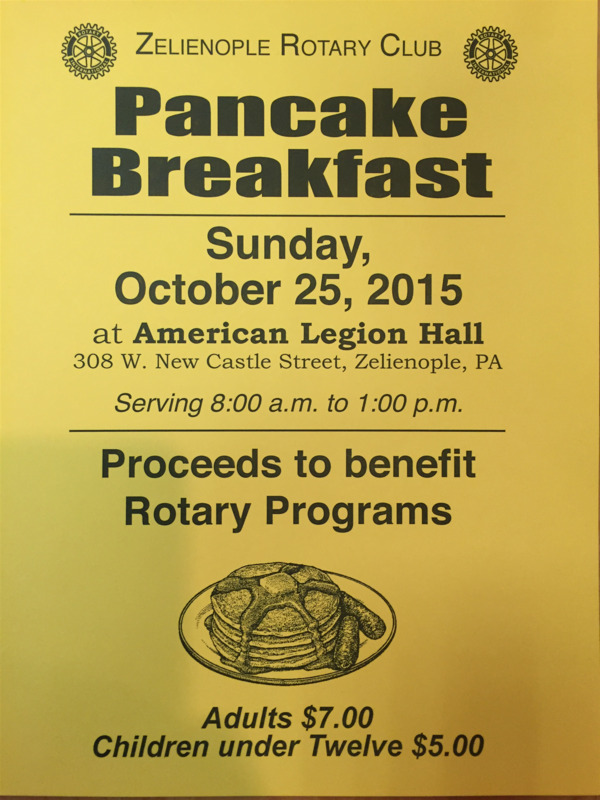 Proceeds benefit the Zelienople Rotary Club! 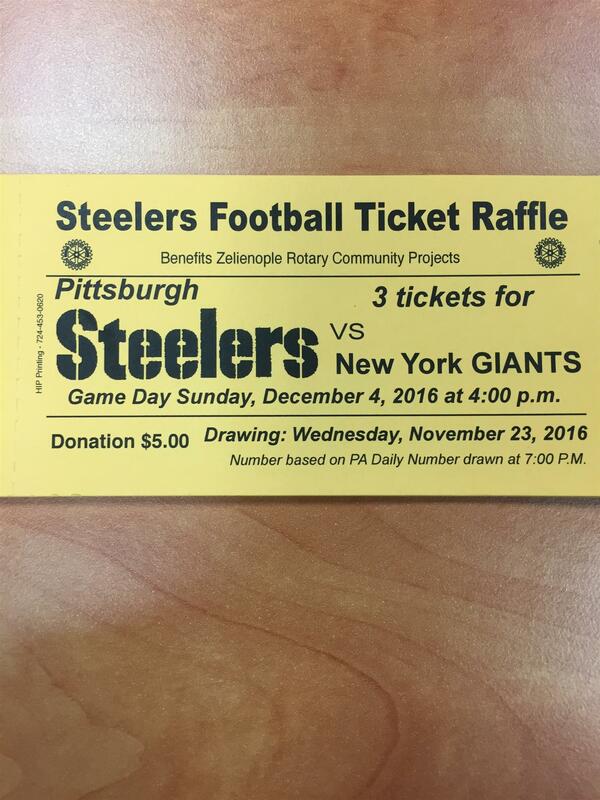 Our club is selling raffle tickets to win 3 tickets to the STEELERS V NY GIANTS game on Sunday, December 4th at 4 pm. Drawing is Wednesday, November 23, 2016. Number based on PA Daily Number drawn at 7pm. Donation is $5. 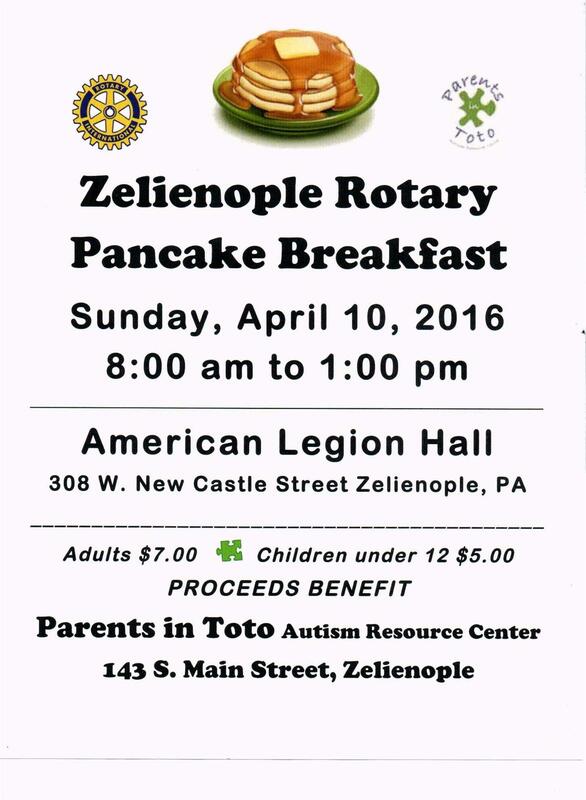 Proceeds benefit Zelienople Rotary Community Projects. 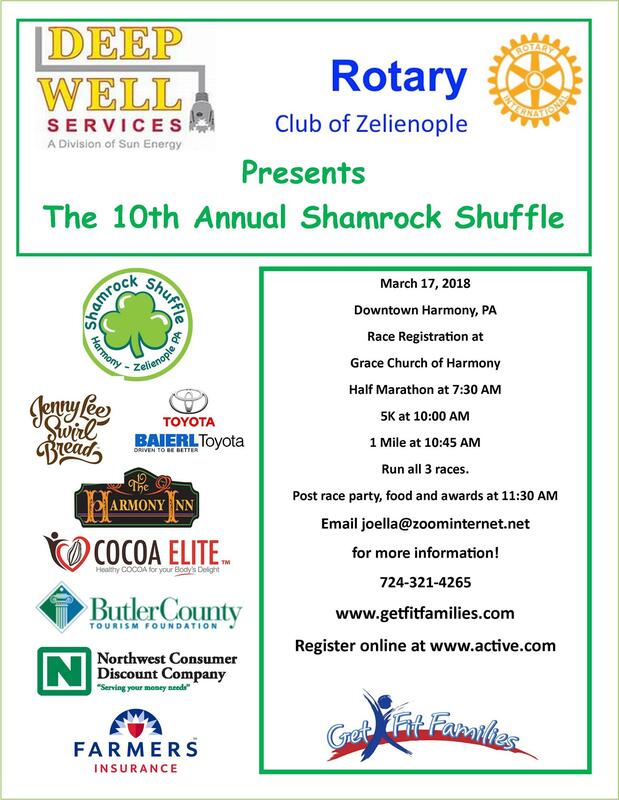 Raffle tickets can be purchased from any Zelienople Rotarian and these local Zelienople merchants: Northwest Consumer Discount Company, WesBanco, Barber Dan's, Marshall's Hair Salon, & Mussig's Florist. ALL YOU CAN EAT PANCAKE BREAKFAST! We will be serving regular and blueberry pancakes along with fruit, sausage & Flaky biscuits covered in sausage gravy. We will also have chocolate chip pancakes for the kids. Only $7 for adults, $6 for senior citizens and $5 for children (under 12). 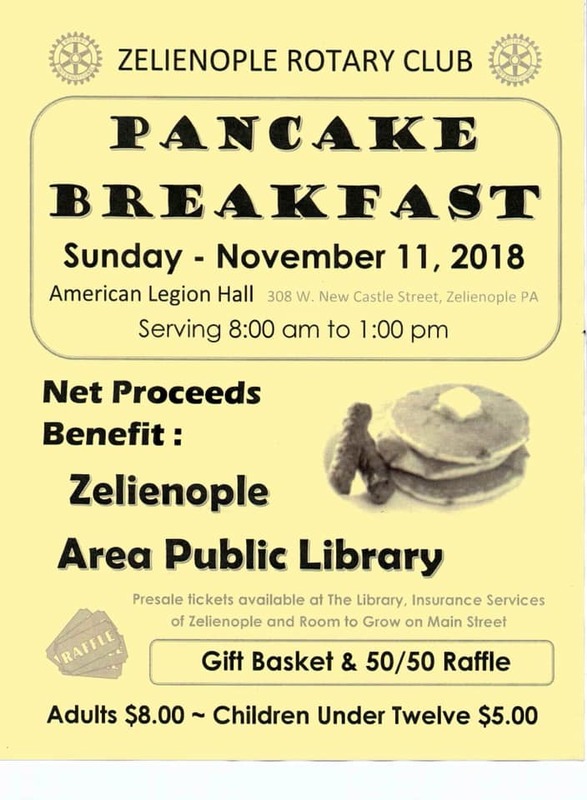 You can get tickets before the breakfast from any Zelienople Rotarian or from the following Zelienople merchants: Wesbanco, Barber Dan's, Marshall's Hair Salon, & Mussig Flourist. You can also pay at the door on the day of the Breakfast. 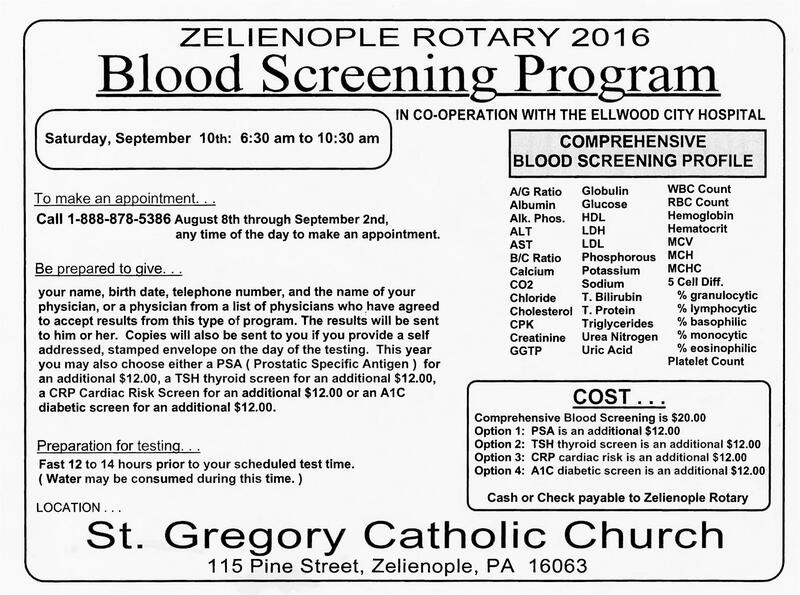 The Rotary Club of Zelienople will sponsor a blood screening program from 6:30-10:30 a.m. on Saturday, Sept. 10, at St. Gregory Catholic Church, 115 Pine Street. 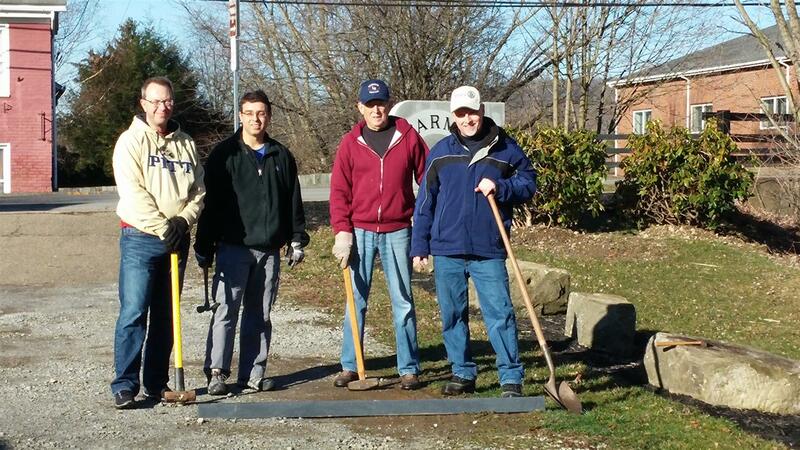 The program will be conducted by the Ellwood City Hospital. A Comprehensive Blood Screening and other additional options are available. Costs vary by the tests being conducted, but are often less expensive than insurance co-pays. For more information or to make an appointment, call 1-888-878-5386 through September 2. Be prepared to provide name, birth date, telephone number and physician name. Participants will need to fast for 12 to 14 hours prior to their scheduled test time. The Zelienople Rotary Club is requesting donations of household, yard and/or other sellable items for its upcoming yard sale to benefit its projects at the Zelienople Community Park. If any area resident has sellable items they would like to donate, they are asked to drop them off in the Rotary PMF Storage Unit at the Zelienople Community Park on East Beaver Street. No TVs please. 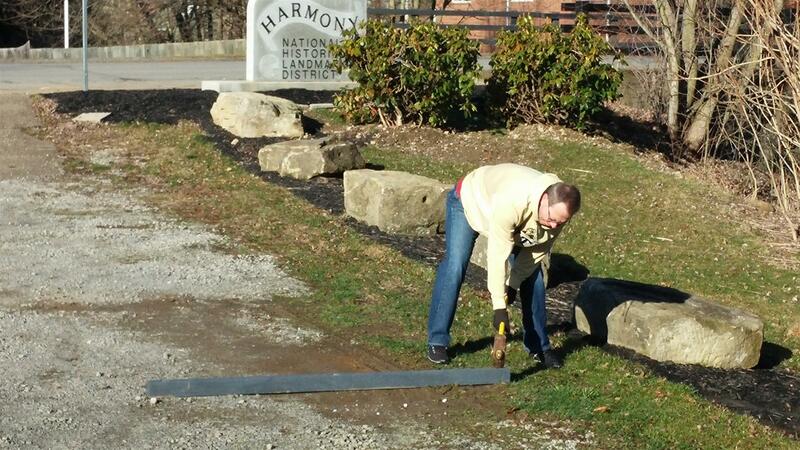 Residents can also call 724-816-6410 and Rotary will pick up the donated household, yard or other sellable items. 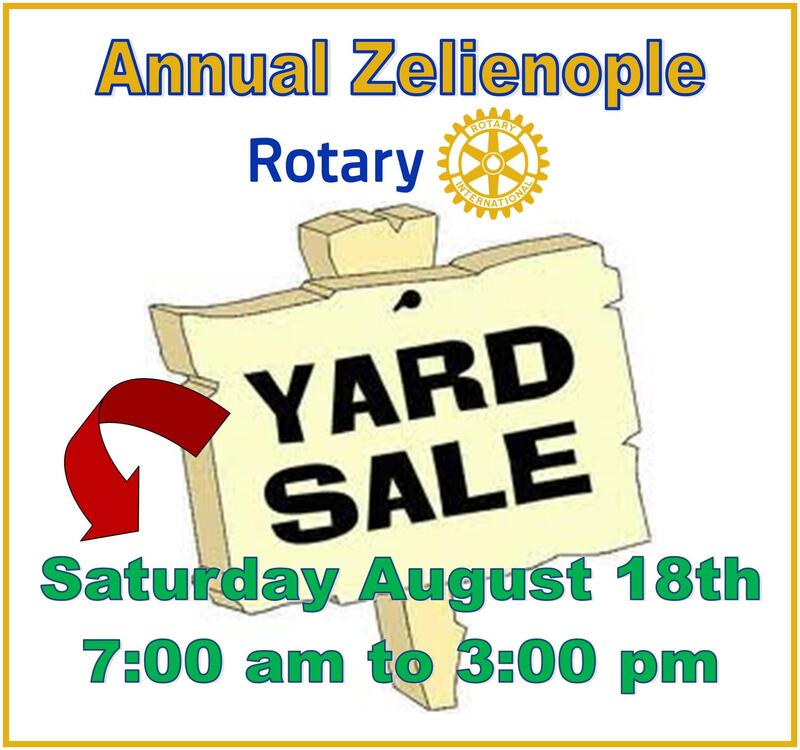 The Zelienople Rotary Yard Sale will be held on Aug. 20 at the Zelienople Community Park. 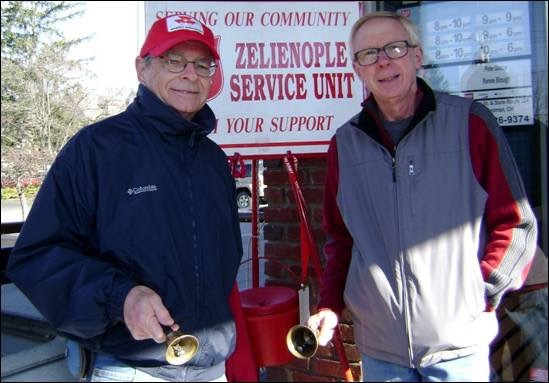 The Zelienople Rotary Club supports the Zelienople Community Park through financial donations and volunteer work projects. Parade starts at 11am. If you are interested in being in the parade, please stop by our sign up table on High St behind Nextier Bank and help us make this year's parade the biggest yet! Sign up's begin at 10am on July 4th. Some of our past parade entrants include classic cars, floats, tractors, bicycles, go carts, unicycles, marching units, dance groups, horses, politicians, & local businesses. The staging area of the parade is on High Street. The parade starts on East Grandview Ave and then goes South on Main Street and turns left onto Beaver St. Chances are good that you know someone who has a child on the autism spectrum. Of every 68 children born today in the United States, one will have autism. According to the Centers for Disease Control and Prevention (CDC), autism is the fastest-growing developmental disability in the U.S. – increasing 119 percent between 2000 and 2010. 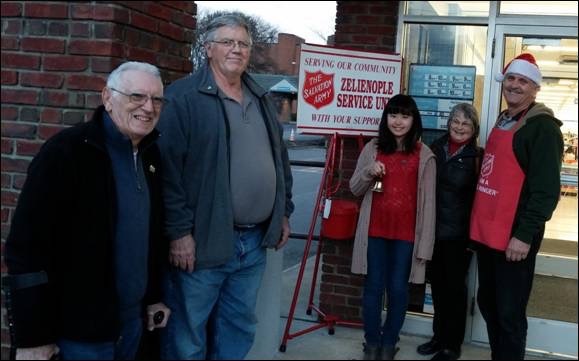 This year the Zelienople Rotary Club decided to help. The club will donate proceeds from its annual spring pancake breakfast to Parents In Toto, an organization that serves families of children, teens and adults on the autism spectrum. The Parents In Toto Autism Center, located at 143 S. Main Street, Zelienople, provides a relaxed and comfortable environment where families can share ideas, learn from experts, explore new resources and make friends. Parents In Toto relies on charitable contributions to keep their services free of charge. 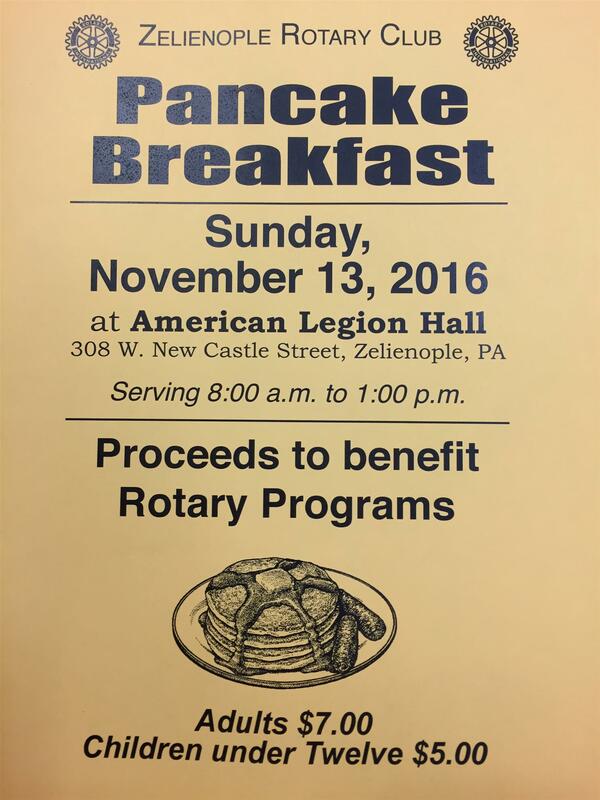 The pancake breakfast fundraiser will be from 8 a.m. to 1 p.m. April 10 at the American Legion Hall, 308 W. New Castle Street, Zelienople. Tickets, available for purchase at the door, are $7 for adults and $5 for children under 12. For more information about Parents In Toto, contact 724-473-0990 or info@parentsintoto.org. 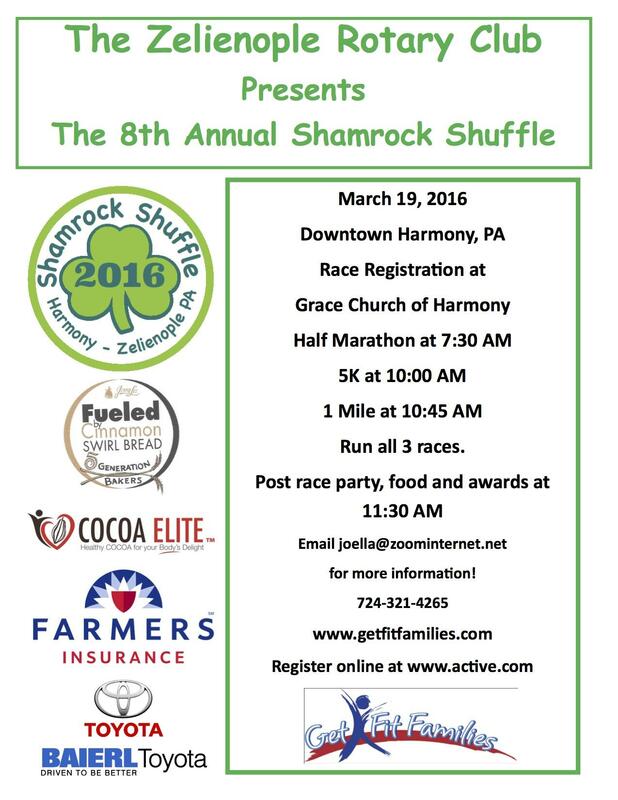 Please join us for The Shamrock Shuffle on March 19, 2016. 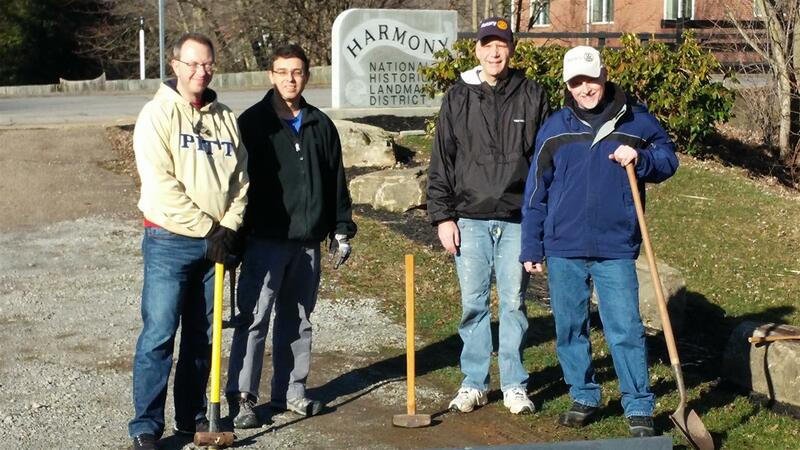 The start is in downtown Harmony, PA. Registration & Packet Pick up on March 18th @ Grace Church in Harmony from 4:00 - 6:00 pm and March 19th starting at 6:30 AM. 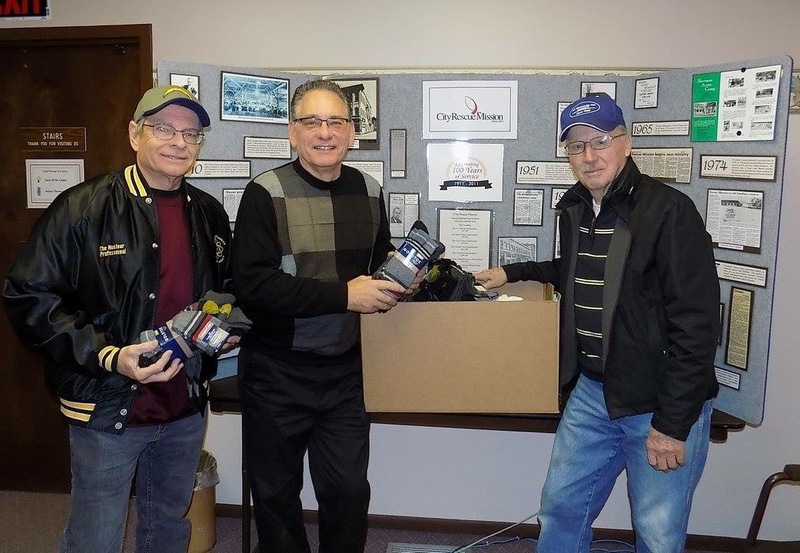 Special thanks to Zelienople Rotarians Don Ridgley and Skip Kennedy for delivering 124 pairs of socks for Christmas to the City Rescue Mission in New Castle. 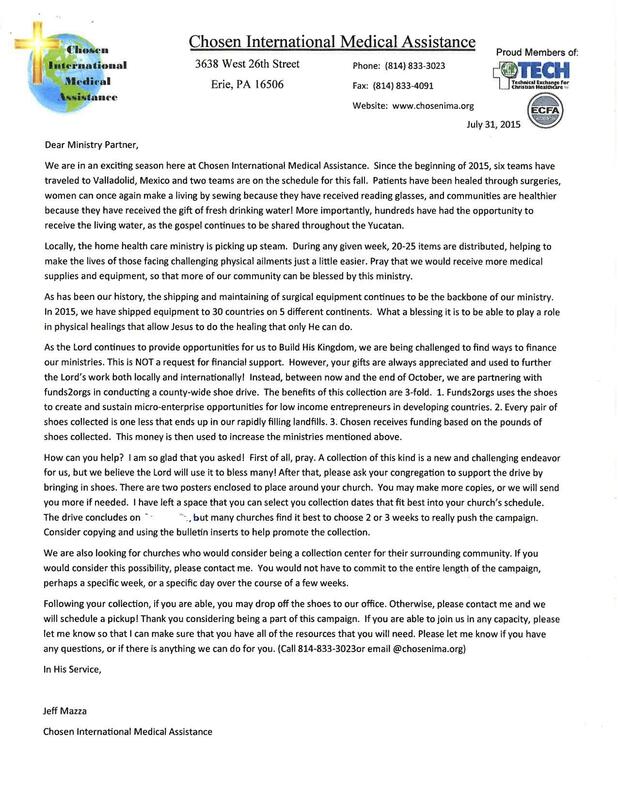 For more information on how to donate to this worthy cause, go to www.cityrescuemission.org. 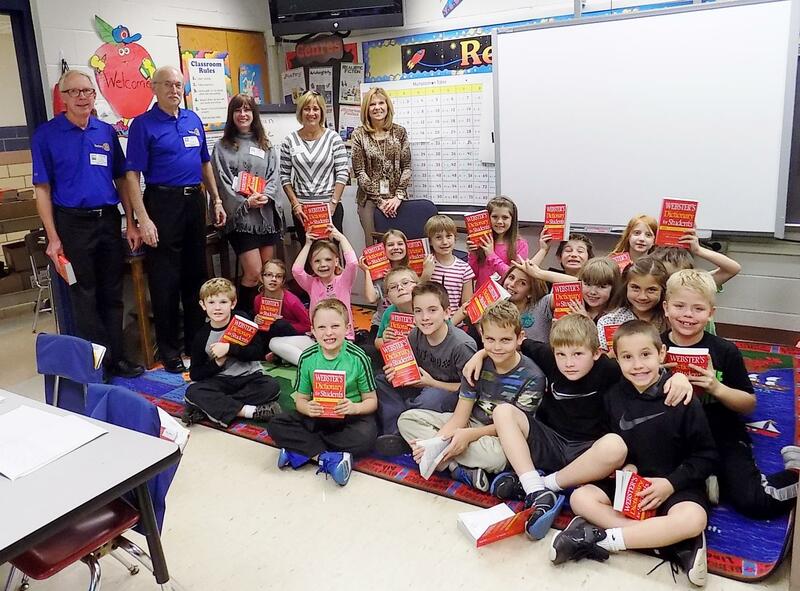 Our club recently gave dictionaries to 3rd graders at CVE and St Gregory's Catholic Church in Zelienople. The picture above is Room 38 at CVE in Zelienople showing off their new dictionaries we distributed on October 20th. From left, are Rotarians Vic Peffer, Craig Lutz, Betsy Stubna, Debbie Lindewirth and teacher Carol Garbett. We would like to thank everyone for stopping out today for our Pancake Breakfast and supporting our clubs many worthwhile projects. We also had some great Halloween costumes as you can see in some of the pics below. ALL YOU CAN EAT PANCAKE BREAKFAST! We will be serving regular and blueberry pancakes along with fruit, sausage & Flaky biscuits covered in sausage gravy. We will also have chocolate chip pancakes for the kids. Only $7 for adults, $6 for senior citizens and $5 for children (under 12). You can get tickets before the breakfast from any Zelienople Rotarian or from the following Zelienople merchants: Northwest Consumer Discount Company, Wesbanco, Barber Dan's, Marshall's Hair Salon, & Mussig Flourist. You can also pay at the door on the day of the Breakfast. Please join us for breakfast and don't forget to wear your favorite Halloween costume. All visitors wearing a costume will have a chance to win prizes. Costumed kids under 8 eat FREE during the fundraiser, which includes all the pancakes, sausage, fruit, biscuits with gravy, and beverages they can eat. Adults in costume will get $1 off the ticket price! 2016 ENJOY COUPON BOOKS NOW ON SALE! Cost is $30 and is loaded with coupons all throughout Butler County and the Pittsburgh area. Enjoy coupons for dining, travel, sports and recreation, theaters, and special events. 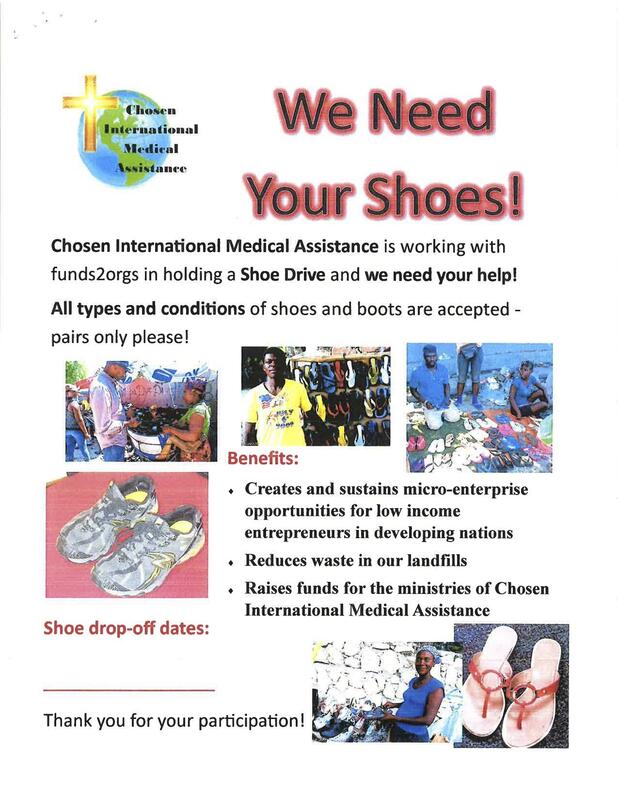 Proceeds benefit Zelienople Rotary Club Community Projects. 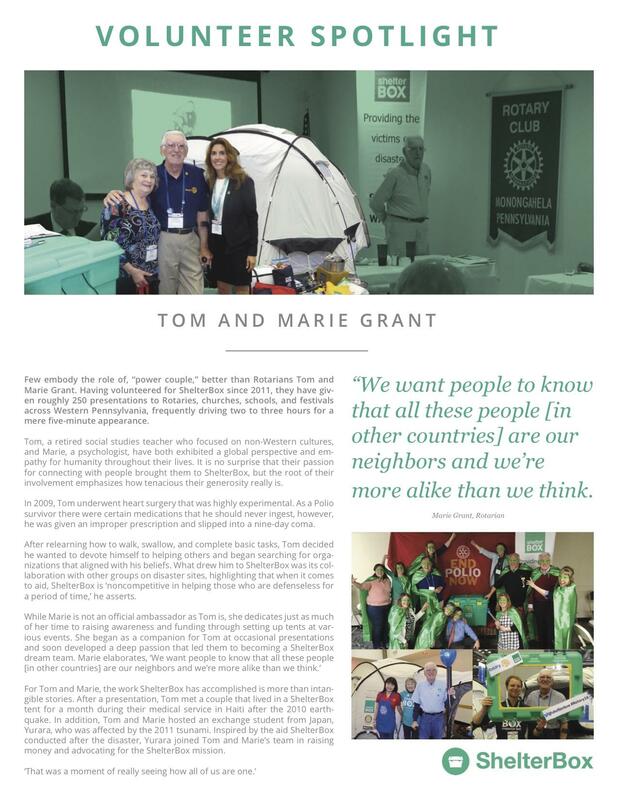 Books can be purchased from any Zelienople Rotarian or these local merchants: Northwest Consumer Discount Company, WesBanco, Barber Dan's, Marshall's Hair Salon, & Mussig's Florist. 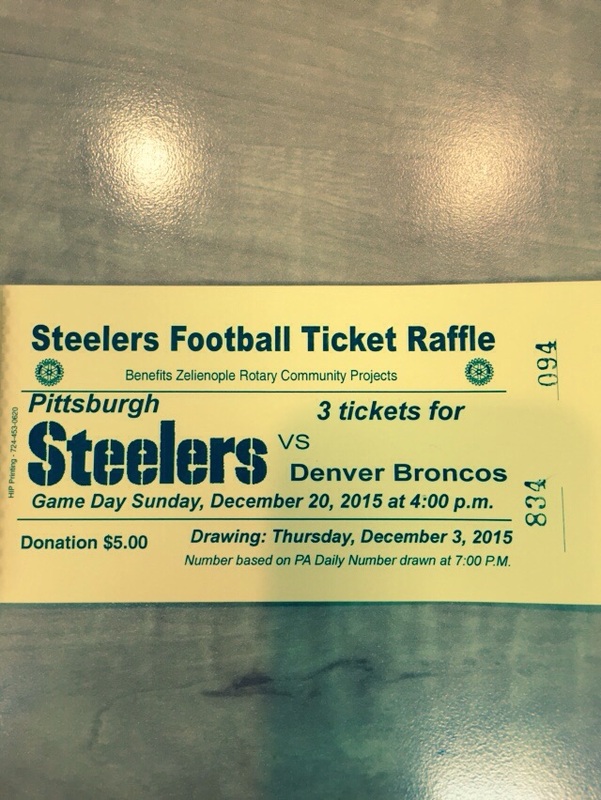 Our club is selling raffle tickets to win 3 tickets to the STEELERS V BRONCOS game on Sunday, December 20th at 4 pm. Drawing is Thursday, December 3rd. Number based on PA Daily Number drawn at 7pm. Donation is $5. Proceeds benefit Zelienople Rotary Community Projects. Raffle tickets can be purchased from any Zelienople Rotarian and these local Zelienople merchants: Northwest Consumer Discount Company, WesBanco, Barber Dan's, Marshall's Hair Salon, & Mussig's Florist.